Lilian Thomas Burwell, born in 1927, was educated at the High School of Music and Art in New York and Dunbar HS in Washington, D.C. She attended Pratt Institute and DC Teachers’ College before obtaining her MFA at Catholic University. She did her practice teaching at Pratt before becoming master teacher in art in the public schools of Washington DC and part of the Visual Arts faculty there at Duke Ellington School of the Arts. She has broad experience as curator, director and activist in the arts. In 1997 Hampton University Museum in Virginia published her book From Painting to Painting as Sculpture: The Journey of Lilian Thomas Burwell in conjunction with her thirty-year retrospective exhibition there. Her work is an expression and a reflection of the history of her own reactions and experiences. Her adventure beyond ‘pictures’ in what was academic realism has changed dramatically. In the sixties and early seventies it became an abstract expressionism which then evolved into an abstraction more inferential of nature. In the eighties her paintings on the flat surface moved into space as wooden canvas-covered environments, evolving into paintings into which one could literally walk. 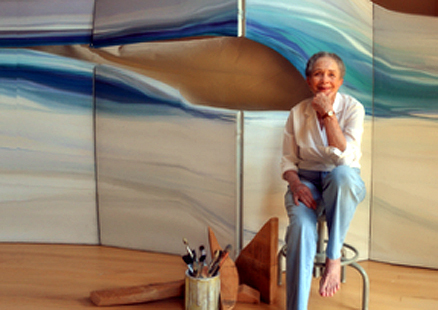 At present her canvas-over-carved-wooden shapes, still paintings, are clearly sculptural. Still reaching beyond herself, she often introduces clear acrylic to project the works beyond themselves further toward the realm of spirit.